5:30 pm : Later at Aponjon Hotel it looks slightly less red but very much like a disk of cheese with a warm coloured orange light cast on it. It is slightly higher in the sky. It seems to have developed a five o’clock shadow in one corner of its chin, but it’s so slow that we doubt if the eclipse has actually begun. Funny thing, I can’t actually see many stars, just the evening star right above us. 6pm: It definitely is the eclipse. There is a chunk of the moon missing from the sky. We watch the eclipse, watch the earth’s slow progress across the sky. I think of this silent unstoppable coordinated dance between three giant moving bodies. A dance only fathomable to us by the shadow the earth casts on the moon, by the shadow we cast on the moon. A brief but measurable sense of our cosmic journey. I feel awe. 7 pm: Now it resembles a clove of garlic. Song in head: “When the moon hits your eye like a big pizza pie…” clearly awe has left us and we are being a little silly. 8:10 pm: It looks like a thumbnail clipping – at least that is not food. 8:20 pm: If I looked at the sky now for the first time that night without knowing anything about celestial occurrences, I would have instantly thought something had ripped a bright little slit through an inky black blanket that covered the sky. No stars are visible. There is just a rip, a sliver of Heaven glowing through an otherwise impenetrable black. You can easily see how omens and predictions could come about. 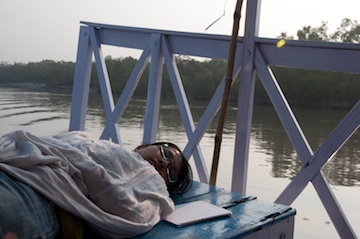 In the city watching an eclipse, such a thought seems silly, but out in the Sundarbans there is no escaping the leap in your heart when you look up and see something undoubtedly wrong with the sky. 8:30pm: The total eclipse. 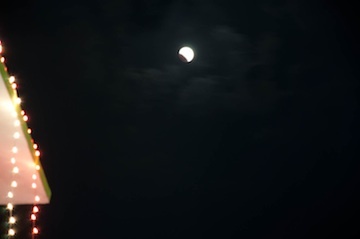 The part of the moon that had been disappearing into shadow suddenly can be made out, lit only by the corona as the earth completely eclipses the sun from the moon’s point of view. Curiously, the moon does not disappear from the sky like you are led to expect. It gets swallowed by the shadow and when that shadow is fully cast, the moon looks like a very pale imitation of itself. It still is faintly red and oddly, stops looking like a two dimensional disk and looks more spherical, more three dimensional, with a faint shading around the edges that show a depth distinct to a sphere. 7:45 am: The moon appears again this morning, high-ish in the sky. We are on the river, on a launch wending our way through thick morning fog. I am watching through a window below deck. In the milky whiteness, my mind plays tricks on me again, I think the white disk is the sun struggling to shine through a thick white curtain. Then the boat turns and the real sun reveals itself, perfectly spherical with a soft incandescent glow that you see through the haze that surrounds it. There is no chance of mistaking it for the moon. Song in head: CSNY’s Cathedral. Not for the lyric as a whole but for the tune/ movement of music and I suppose random bits of lyric that my unconscious throws at me that seem to fit. The song just mirrors in a different context the emotional responses of the present moment. After dinner: Rhea and I talk about stories of the Lady in the Moon. The moon looks exactly like it should on the Chinese Full Moon festival. I tell her the Chinese story of the princess of the Heavens trapped on the moon by her father for falling in love with a shepherd on earth, and how the cranes take pity on them one night in the year (the day of the Moon Harvest Festival) and form a walkway across the sky between the earth and the moon with their wings so the lovers can meet for one night. The Bengalis and Chinese both have a Lady that lives on the Moon, the Romans and Greeks have Diana and Selene of the Moon. It is only the west that seems to talk about the Man in the Moon, some guy whose hair was made of spaghetti according to a kid’s nursery rhyme that flits across my mind. The song is unapologetically thrown out of my head. After dinner: We walk along the embankment at night, having switched off our torch. The moon is full, bright and brilliant and lights up the whole landscape. Doug suddenly sings 3 notes of “Moonshadow” pointing out our shadows cast by the moon. Have I ever seen my own moonshadow before? The rest of the song plays in my head as we walk back to Help Tourism. I’ve always loved the song but confronted with my own moonshadow it doesn’t seem to make any sense, even just the music of it doesn’t work in the moment. Must find out what was meant when it was written.